Mega Man Star Force returns, delivering totally upgraded and cutting-edge online communication and device customization technologies through a portable RPG adventure that is brought to life in the iconic, action-driven Mega Man way! 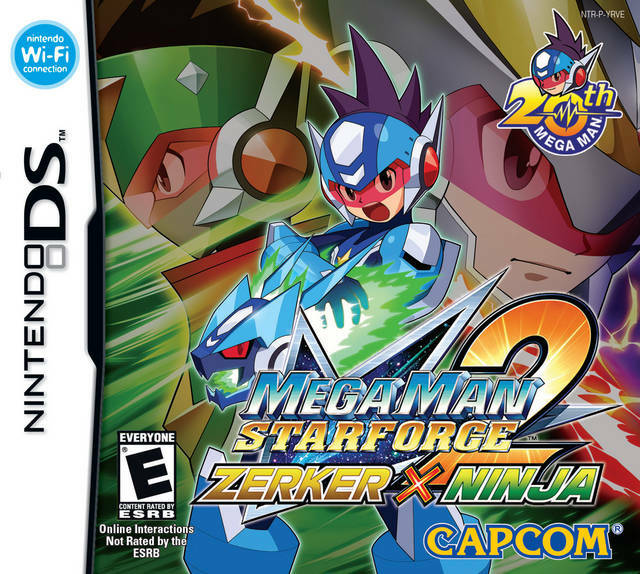 Mega Man Star Force 2 will be available in two versions, Zerker X Ninja and Zerker X Saurian with players able to choose between Zerker, Ninja, or Saurian depending on which version they choose. Developed by the team behind the popular Mega Man Battle Network series, Mega Man Star Force 2 continues two months after the previous game left off. Geo Stelar and crew return to battle a whole host of new enemies including the mysterious Rogue who threatens the peace of the virtual Wave World by unleashing hordes of rampaging viruses. It's up to Geo and his virus-busting buddy, Omega-Xis, to thwart this latest threat. Mega Man Star Force 2 blends a unique formula of RPG exploration elements with fast-paced action, as players travel and battle between coexisting worlds, the physical world and the virtual Wave World, to unravel the mystery around this new troublemaker. Players will encounter enemies in the virtual Wave World and battle them on three-by-five battle grids with their Battle Card deck. Mega Man Star Force 2 also adds an upgraded "Transer" system. Two co-existing worlds – explore the real world in human form and transform into Mega Man to maneuver through the virtual "Wave World"
Each game version offers a unique powered-up transformation of Mega Man based on the respective elemental powers and can unleash spectacular special attacks, including "Zerker," which bestows Mega Man with a huge sword imbued with the power of lighting, "Ninja," which boosts Mega Man's speed and enables him to throw a huge Shurikan and "Saurian," which gives Mega Man the power of explosive fiery fists.